In the 57th issue of the Bed and Breakfast E-Traveller, we invite you to visit Lanark County in Ontario; during the winter season, Lanark County is a perfect travel destination for recreation, relaxation and exploration. Lanark County is right next door to Ottawa and an easy drive from Toronto, Montréal and Kingston, yet it’s a world away from the hustle and bustle of city life. This picturesque, rural region is a quiet and peaceful destination where visitors are encouraged to relax and enjoy the stunning landscapes, the welcoming rural culture, and the quaint towns and villages. Travelers who come to this region find themselves pleasantly surprised at the vast range of things to see and do across the County. 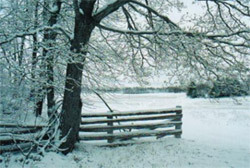 A long winter season and copious amounts of clean, white snow make Lanark County a perfect winter playground. Mount Pakenham offers tubing, downhill skiing and snowboarding. The clean waters of the numerous lakes and rivers make for excellent ice fishing. Trails for cross-country skiing and snowshoeing will beckon you to explore the great outdoors and observe some of the wildlife and bird species that abound in the country and woodland settings. In addition, Lanark County’s lakes, forests and farmland beckon snowmobilers who come for the crisp, cold winter and the warm hospitality. Snowmobiling in this region takes you through diverse landscapes ranging from tranquil rolling countryside to the rugged Canadian Shield. When the Scottish and Irish settlers arrived in the early 1800’s, forests covered the entire landscape. In order to survive, they cleared the trees in select areas and began to farm the land. In the northern end of the County, with its vast timberlands, the trees provided a valuable natural resource. The log homes and barns, both heritage and contemporary, and the rail fences that crisscross the landscape, still attest to the ready availability of this local timber. Heritage stone buildings are also evident across the County. That’s because the many stone masons who came to this new land to help build the Rideau Canal, spread out after that giant construction project was ended and constructed homes and other buildings throughout the area. Many of these heritage buildings can be found simply by touring through the countryside and visiting the little historic towns and villages located in Lanark County. Perth: Located on the Tay River, and the County Seat since 1850, Perth proudly holds a national heritage award for architectural preservation. Pakenham: This charming village, located on the Mississippi River, has the only five-span stone bridge in North America. Smiths Falls: Located in the heart of the Rideau Canal system, this town is a thriving commercial centre with attractions ranging from the Rideau Canal Museum to the Hershey Chocolate Factory. Almonte: This picturesque 19th century town on the Mississippi River was home of Dr. James Naismith, the inventor of basketball. Lanark: This historic village on the Clyde River serves as a gateway to the Lanark Highlands, a largely unspoiled naturalist’s paradise. Carleton Place: On the banks of the Mississippi River, Carleton Place has the oldest canoe club in Canada and a bustling high tech industry. Learn more about the area by visiting any of the 13 different Museums in Lanark County. They all provide a wealth of information about the history and the settlement that occurred. In addition, history buffs and individuals researching their ancestry can easily access detailed historical information by contacting the Lanark County Genealogical Society and visiting their Genealogical Library and the Lanark County Archives. The Lanark County Bed & Breakfast Association invites you to come and enjoy a winter holiday in Lanark County. Charming Bed and Breakfasts across the County, from the casual country home to the elegant heritage mansion, will welcome you with genuine warmth and hospitality and will be sure to meet and exceed the expectations of even the most discerning visitors. To begin your winter adventure and find out more about the many visitor attractions in Lanark County, contact the Lanark County Tourism office at 1-888-452-6275, by email at tourism@county.lanark.on.ca or check out the Lanark County Tourism web-site.